Hot on the heels of the devastating recall that stopped sales of Galaxy Note 7, Samsung is now facing additional lawsuits that allege the company was aware of battery overheating and fire hazards for years--including its Galaxy S6, S6 Edge, S6 Edge+, S6 Active, S7, S7 Edge, S7 Active and Note 5--but failed to address the issue or warn customers. Legal action has now spread to multiple class action cases in three different states. Samsung's $5 billion Note 7 inferno destroyed its phablet last fall and took down the Gear VR Oculus-based Virtual Reality headset with it. However, a new class action lawsuit filed this month by Dale Holzworth in Massachusetts alleges that the company's other products also share the same problematic battery issues pose risks to users. Holzworth said he purchased a Samsung Galaxy S7 Edge last year that caught fire while charging in his son's bedroom, spreading flames to the mattress and sheets while dripping molten metal that burned holes in the carpet. "Outside of the Note 7 recall, Samsung has taken no steps to recall or warn consumers about the risks of overheating, fire and explosion posed by their Subject Phones," the plaintiff stated, despite alleging that the Galaxy phone maker was aware of complaints from users regarding overheating batteries dating back to 2011. The lawsuit cites the team at Samsung that designing the "thermal spreading" system as stating that "due to the spatial limits of smartphones, the cooling system's cooling capacity alone is not enough to cool the device. We need to calculate the amount of electric current and optimize the heat control algorithm to minimize occurring heat. In other words, the new thermal spreader hardware controls the heat more effectively but the software heat-control algorithm must be made compatible to ensure best performance." Four other class action lawsuits filed in New York and California also describe similar complaints with the same series of high-end Galaxy flagships sold over the last two years. A case filed in New York by Claire Gilligan noted that Samsung has sought to deliver the largest batteries with the shortest recharging periods, but alleges that the company cut corners to maximize performance and does not do independent testing of its batteries as other phone makers do, relying solely on the internal testing that allowed the Note 7 to reach buyers. 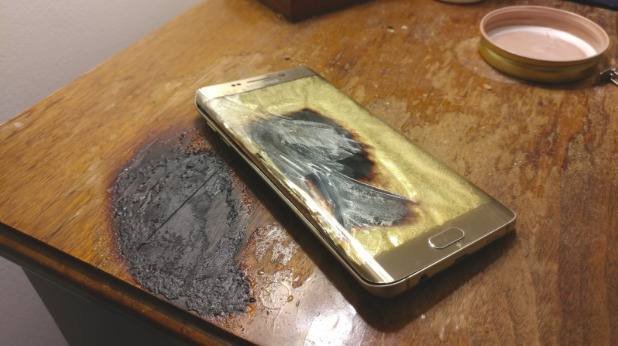 Between March in December of last year, Gilligan said she was forced to replace her Galaxy S7 four times due to overheating that caused malfunctions, including her original charger that began emitting smoke after overheating while charging. The suit asks the court to order Samsung to offer owners of affected Galaxy phones the same refund and exchange program that it set up for Note 7 buyers. Gilligan stated that if she had known about the overheating issues that affected several generations of Galaxy S and Note models, she would not have bought the Galaxy S7. Three parallel cases have also been filed in California. Citing a materials chemistry professor from MIT, one lawsuit states that the batteries Samsung uses are susceptible to internally releasing oxygen at the negative terminal when overcharged, rapidly discharged or if there is a defect in a battery cell. That sets off a "thermal runaway" condition that turns the battery into what the professor described as a "bomb," reaching temperatures of 1100 degrees Fahrenheit (593 Celsius). Samsung claimed that its Galaxy customers do not have the right to sue the company for fire-related damages, but are contractually obligated to resolve any claims via private arbitration, apparently due to an End User License Agreement it includes on the boxes of products buyers open. In April, the United States Judicial Panel On Multidistrict Litigation denied the consolidation and transfer of four battery fire cases involving 8 overheating Galaxy phones, saying that MDL was unnecessary because "alternatives to centralization, such as informal cooperation among the relatively few involved attorneys and coordination among the involved courts, are eminently feasible and will be sufficient to minimize any potential for duplicative discovery or inconsistent pretrial rulings." However, a series of four California lawsuits will be combined into one case. Buyers in other states affected by Galaxy battery overheating and fire risk will apparently have to file their own suits in each state. Existing lawsuits seek to address the rights of buyers to get a refund for up to four years after buying a defective Galaxy phone sold in 2015 and 2016. The cases all list the same series of Galaxy S6, S7 and Note 5 models, which along with the recalled Galaxy Note 7 involve every flagship phone the company has sold over the past two years (there was no Galaxy Note 6, as Samsung jumped that product name to increase the model number to more favorably compare its newest phablet sized phone against Apple's iPhone 7 last fall). This year Samsung similarly shifted its Galaxy S8 branding on the S8 Plus model to more directly invite comparisons with Apple's iPhone 7 and 7 Plus models. Despite efforts to get previous battery overheating issues under control--including the inclusion of new "heat pipes" to cool its flagship phone starting with last year's S7, there are many reports of Samsung's newest S8 models overheating, too. 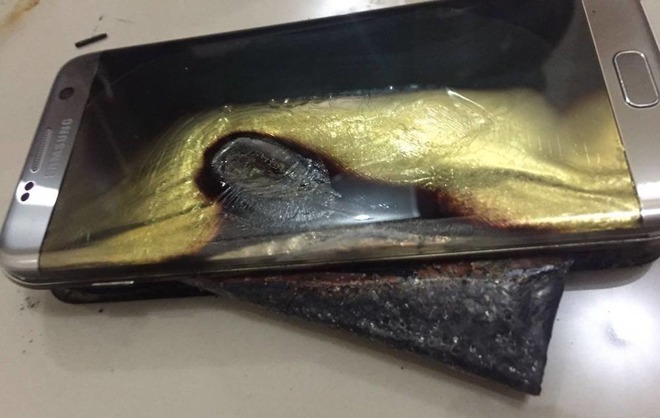 At the same time, there are also blog postings such as one by Raymond Wong for Mashable which claimed in its headline that "It sure looks like the Galaxy S8's battery won't explode even if you stab it with a knife!" Eight paragraphs into the piece, it noted that its irresponsible claim was based on an "unscientific test" portrayed in a YouTube video that "may not accurately reflect the durability of final retail models," casually adding that after suffering damage "its battery could explode. You do so at your own risk." Galaxy S8 has also exhibited a red tint color calibration problem, what the company described as being "due to natural variations in displays." Last year, class action lawsuits also targeted iPhone 6s for an issue named "Touch Disease," involving a screen flicker issue when the device was repeatedly dropped on a hard surface. Apple responded with a repair program to address the issue, and included a reimbursement for users who had paid out of pocket to repair their devices. The company issued a statement saying, "Apple has determined that some iPhone 6 Plus devices may exhibit display flickering or Multi-Touch issues after being dropped multiple times on a hard surface and then incurring further stress on the device."